Upanah, paduka (in Sanskrit), kharawan (in Hindi) or sandal has been a popular form of foot covering in Indian culture from the Vedic period onward. Juta and juti (in Urdu), chappal or morjari (in Hindi) these slippers and shoes are the few other types of foot covering that have plenty of references in classical Sanskrit literature and in Buddhist, Jain and in the Sangam Tamil literature from South India. Apart from literary references foot coverings have been beautifully depicted in Indian art too. In addition to literature and art, shoes got the highest reward of its importance in the Epic Ramayana and in Tamil culture, which has no parallel in any other culture of the world. The rich Indian classical and folk literature provides the fine details on the types of foot covering, the material and color used for making them shoes and the occasion of use and other related customs. On the other hand numerous miniature paintings show the variety of shoes and its users. So far, actual shoes of the museums and private collections are less reported1. Therefore an attempt has been made here to discuss the shoe collection of the National Museum of India located in New Delhi. Before discussing the actual objects in detail, it will not be out of context to give the brief history of shoe tradition in Indian literature, art and its symbolic meaning. The ‘ Upanah’ or ‘Upanat’ is the term used for sandal or shoe in the Vedic literature. This word has been referred to in Yajur Veda Samhita2, the Atherva Veda3 the Brahmanas4 and Panini grammar5, which gives the impression that Upanah were probably the most common type of foot wear used by the lay person in ancient India. Such foot wear were worn even during the ritual ceremonies and by mendicants in that period6. The skin of the antelope or boar was used for making such foot wear7. Upanat is denoted for shoe, while paduka or padu denotes a sandal or the toe knob sandal from the time of the Mahabharata8. Paduka, also known as kharawan is one of the simplest forms of foot covering. Buddhist literature provides a great deal of information regarding the shoes prevalent in those days. During the Buddhist period laypersons used sandals made of several kind of material such as gold, silver, jewel, crystal, bronze, glass, tin, copper, hintal wood and munja grass. The Buddhist text Mahavagga reveals that sandals made of above mentioned materials were prohibited for monks and nuns. Buddhist and Jain monks and nuns were not allowed to wear fancy attire or shoes. They were only permitted to wear single soled shoes, while they were allowed to wear gifted old shoes. About the types of shoes it further mentions four types: putabaddha, shoes that covered the ankles; padigunthima, full boots; tulapunnika, shoes padded with cotton wool; tittirapttika, those shaped like the wings of partridge or decorated with horns of a ram or a goat. Shoes with separate points like a scorpion’s sting or decorated with peacock feathers, etc. were in great demand in ancient times and because of their elaborate decoration, it was forbidden for Buddhist monks9. Bharat in saintly outfit is shown worshiping the Paduka of Ram, which have been placed on throne in a tent. India. Early 19th century. Ivory. L.20XW.10.4 cm. Jain sources inform that the leather was in common use for making shoes. While describing them, it also discusses the type of material used for shoe, color, material and style of shoes. Brihat-Kaipa-Sutra-Bhasya mentions the comprehensive guidelines for attire and foot wear of monks and nuns. It mentions that for making shoes, different type of leather is used, which can be obtained from the hide of cows, buffaloes, goat, sheep and wild animals. Shoes are made of colored leather and available in four different type; sakala-krtsna, pramana-krtsna, varna-krtsna and bandhana-krtsna. Sakala-krtsna, the single soled shoes, known as eka-putam or ekatalam and also known as talika, were allowed to be worn by Jain monks to protect them from thorns when walking at night. Praman-krtsna shoes had two, three or more soles, Ardh-khallaka or half shoes covered half the leg and khallaka (samasta-khallaka ) or full shoes covered the whole leg10. Bana, the famed court poet of Emperor Harsh Vardana of Kannauj (present district of Western Uttar Pradesh) of 6th -7t h century describes in detail the court of his patron and the various kinds of activity in his writings. In one of his work, Harshacharita, the poet describes the attire of a Hindu mendicant, who wore a loin cloth of cotton, a scarf over his shoulders and paduka on his feet11. During the period of Ala-ud-din-Khilji (in around 13th century) another poet Amir Khusrau mentions kafsh, which were supposed to be “high heeled slippers shod with iron12. In the Gujarati and Hindi literature of the 15th century, Islamic rulers have been mentioned as wearing long attire and full boots, which were known as khalyai paijara. Paduka. Flat upper surface with scale motif and check design at the back. Stylized partit and fish tail pattern has been worked on outer & inner side of the object. When both the padukas are placed together it forms the Vishnupad. Southern/Central India. Early 20th century. Ivory. L.24.5XW.8.8XHt.2 cm. Paduka. Flat upper surface in bud shape, mica and ivory sheet has been fixed on wooden surface. Ivory sheet worked in lattice work with floral pattern. 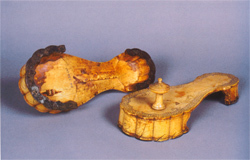 It has rectangular heel on both the ends and use of ivory nail is very interesting feature of the object. Western India. 19th century. Wood, Ivory, Mica. L.24.5XW.9.3XHt.11cm. The Ain- i-Akbari written by Abul Fazl Allami describes the life of Emperor Akbar’s court with detailed information about activities prevalent in every aspect of life. While describing the “Sringara or Ornaments of Dress” in his chapter he writes that men and women’s costumes are complete with twelve and sixteen objects and sandals or shoes are one of them13. 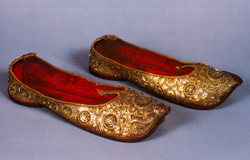 Sir Thomas Roe, who visited Emperor Jahangir’s court, writes about Emperor’s shoes, “On his feet a pair of buskins embroidered with pearls, the toes sharp and turning up”14. It is believed that from then onwards the upturned toe shoes became fashionable and it was named after Salim, son of Jahangir, and were known as Salim Shahi shoes15. The custom of wearing boots was prevalent in the south of India also. Varthema, a Portuguese traveller to India, observed that kings of Vijaynagar wore beautiful dress, but nothing on their feet. The similar custom, by the king Krishna Deva Raya, of barefoot is mentioned by another traveler Domingo Paes who visited South India in the starting of sixteenth century. Actually anybody approaching to king also had to be barefoot which is a mark of paying respect and honour16. With these few literary references it became evident that shoe tradition existed in India from the Vedic period and there was plenty of variety. One of the earliest known surviving examples of footwear is from the Indian subcontinent found from excavation at Chandraketugarh, West Bengal and is dated circa 200 B.C17. This wooden, 29.3 x 12.2 cm sandal has a platform for the left foot, which is wide from the front and tapered towards the back. Holes on either side allowed for straps to fasten the sandal to the wearer’s foot. The surface of this sandal is beautifully decorated with two circular floral patterns done with etching on the toe and heel. The front and back of the sandal has a slightly raised heel. Most of the museums have 16th -17th century actual shoe collections, which are made of leather or iron. However many examples are not known in between, but one can easily find examples of sandal, shoes, boot and slippers in terracotta, stone and bronze sculptures and miniature paintings. A small terracotta sculpture has been found from Chandraketugarh18, which is dated circa first century BCE. The small broken plaque depicts just the feet wearing the beautiful sandal or chappal. It is strapped in a ‘v’ shape, appears to be double, in between from the toe and second finger. The fascinating part of this sculpture is that sole is in the shape of a lotus leaf. The pointed raised knob like depiction around the edge indicates that it had been stitched beautifully. A small terracotta plaque, of 1st century BCE, is yet another example of foot covering19. This broken plaque has only the lower portion, which depicts the legs of a male figure on the move. The side view of strapped sandal has beautiful knotting on the front and slight raised back covering. Around the 3rd and 4th centuries it is evident from several Buddhist stone sculptures from the Gandhara region that it was quite common to wear strapped sandals20. These are of the simplest type with a sole and a strap passing across the instep and another through the gap between the toe and second finger. Kushana and Gupta coins also depict the Emperor wearing a long robe and full boots. The most important evidence is of the sun God Surya from the very beginning. He has been always portrayed with full boots, which is considered to be a Saka or Central Asian influence21. Ajanta paintings of the 4th and 5th century A.D. also depict the foreigners wearing full boots and stockings22. 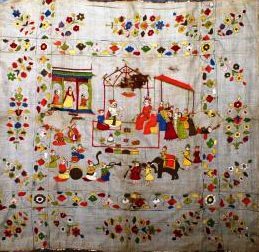 Jain miniature paintings and Mughal miniature paintings from the time of Babar, Humayan, Akbar, Jahangir, Shahjahan, and the later Mughal emperor have been portrayed with half shoe, sandal, slipper, and boot type, half covered, without back and with pointed raised back and slipper type23. 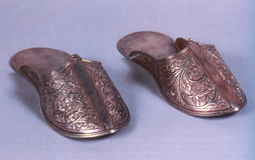 Toe knob sandals are usually associated with the Indian sadhus, the ascetic, religious teacher and holy man as seen in number of miniature paintings from Datia in Madhya Pradesh, Murshidabad in West Bengal, Pahari from Himachal Pradesh, Patna in Bihar, Rajasthan, Sikh (Punjab) school of 18th and 19th century24. After the Europeans arrival in India from the 16th century onwards, boots became fashionable, especially with royalty and the elite, however kharawan, morjari and slippers were used by the common man. 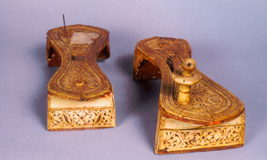 These leather morjaries, half shoes were beautifully embroidered with silk thread, metallic thread sometimes with pearls and semi precious stones as the Nizams of Hyderabad used to have25. The Epic Ramayana describes the most rewarding incident of sandal26. Rama the prince of Ayodhya in fulfillment of the curse on his father King Dasharatha went into exile for fourteen years with his wife, Sita and younger brother, Lakshman. Rama’s other younger brother Bharata requested him to not go into exile but continue to rule the Kingdom, but Rama did not agree. Then Bharata asked for Rama’s golden sandal, which he got and from that day onwards Bharata placed it upon the throne and started worshipping it as a sign of Rama’s presence. Bharata never sat on throne and ruled the Kingdom on behalf of Rama. A beautiful Chola bronze statue of Bharata is in the National Museum collection, which portrays him holding the paduka on his head27. 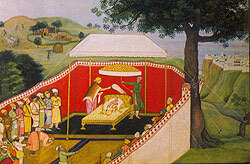 Another example is a miniature painting of the Pahari School, which depicts Bharata worshipping the Rama’s sandal. At the Chencherimali temple in South India, there is a custom of carrying the leather sandal in honour of the deity Subrahmanya. According to myth the Subrahmanya deity was allowed to wear sandals of boar leather. At another South Indian temple, Valli, believed to be daughter of a hunter, has a small shrine dedicated to her at the pilgrimage center of Marudumali, Palani, Sivanmali and Chennilais, Tamil Nadu, where she is represented either in human form or by a pair of sandals. Apart from paduka’s worship, foot prints are also worshipped in Indian ethos28. The decorative arts department of National Museum29 has six pairs of sandals. Out of six, four are padukas, one is a morjari and another is a slipper. 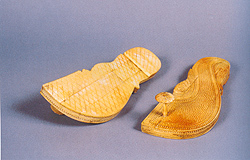 Three padukas are made of ivory, one is of wood inlayed with ivory, while the leather morjari is beautifully embroidered with metallic thread in the zardozi technique and the last pair of slippers is made of silver. One of the earliest pieces in the collection is an ivory paduka, which is intricately carved in a regular shape. The upper surface is beautifully ornamented, knob at the front in between the toe and second finger and raised at the back from toe and heel side. The carving design has been worked in bud shape and it’s both sides has pointed end. Floral decorated edges and circular knob adorn the paduka. The slightly raised pointed toes and heel is also decorated with floral and human figures. With the tight fitting costumes these human figures appears to be European, who hold the gun also, may be hunters. Another ivory paduka of the collection is almost similar in shape, like the earlier one, however it is without decoration. The plain upper surface has only circle designs all around the edges and circular knob is in between toe and second finger. The raised pointed toes and heel has been carved in ridged shape, which has iron strip at the edge, possibly to give the additional strength to it. The use of good quality ivory and use of iron strip indicate that it has been especially made for some strong person to be used in rough and tuff weather. The shape of third ivory paduka reminds the foot prints of divinity. Front side of the paduka or toe side, has straight cut instead of bud or circular shape. Thye entire upper surface has been worked in fish scale motif. The stylized parrot is on the inner side of the paduka and pointed end tip. The back of it has checker design and slightly raised heel. 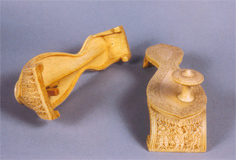 Light weight wooden paduka, without knob, has been skillfully inlayed with ivory. A thin ivory sheet has been fixed on the upper surface, which is beautifully carved with floral pattern lattice work. Slightly raised toe and heel has been worked in ridged design . Leather morjari is beautifully embroidered with metallic thread, which is popularly known as zari workmanship. It has flat sole, pointed tip, leaf patterned projection on the front side and raised back. The outer surface of the morjari is decorated with circular roundels, which has been worked with salma-sitara (gold wire and circular disc). 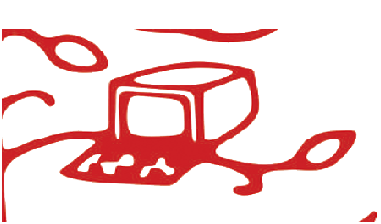 Inner surface of the morjari has red velvet and the faded heel side indicates that it has been used well by the user. Silver slipper has covered front and reminds the boot style. Thehe front surface has been decorated with floral pattern done with repousse technique. Backless slipper is fIat from the sole, circular shape from the back and pointed tip at the front. Such slippers were especially made for ceremonial functions. Although actual shoe collection of the decorative arts department is small yet it is important in many ways. The use of precious material, decorated with intricacies, variety of shapes, which changes its name like; sandals, padukas and morjari makes this collection significant. Tradition of being barefoot is not restricted to emperors, but also it is practiced at the time of visit to temple of home shrine and performing the classical Indian dance. Housed in Jhajjar museum, Gurkul, Haryana, Ahuja, N.P. Moulded terracotta from the Indo-Gangetic Divide, sugh, Circa, 200 BCE -50 BCE, In Marg, Ibid, p-55, pl-12. Schimtz. 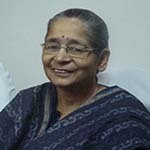 B., After the Great Mughals, Marg Publication, Mumbai 2002, pp-1,2,3. Nizam of Hyderabad use to wear morjari which is fully embroidered with zari thread and salma sitara, instep ornament embellished with rubies, diamonds and emeralds set in gold is in the collection of Beta Museum, Canada. Foot Prints, the scared feet, is the most scared feature of Hindu, Buddhist and Jain culture. There areashatamanalik-chinah (eight symbols of Maha-Purusha, holy man), and foot prints is one of them, which is being worshipped with great devotion b Hindu, Buddhist and Jains, individually by all the three main cultures of India. There number of terracotta, stone, bronze sculptures, woven, printed and embroidered textiles which depicts the foot prints. Apart form decorative arts department, National Museum has shoe collection in the Central Asian Antiques and Anthology department, besides some indirect references in the archeological, numismatic and paintings department.